New Audi's A1 success formula - takes the high-quality interior and prestige badge that have made Audis so popular and puts them in a small, but city-friendly package. The A1 is no more expensive than many versions of the VW Polo, and is now available with a 1.0-litre, three-cylinder petrol engine. This is a great car for two people, and another two sat in the rear won't feel too cramped. However, the boot is really only big enough for shopping bags or small cases. As well as the standard three-door A1, there's also a five-door Sportback version. It has no more room, but access to the rear seats is easier. On the whole this is a fairly quiet car, although it does produce quite a bit of road roar if you specify larger. The S-line specification is also best avoided because this brings sports suspension that reduces comfort. However, Sport models cope well enough with bumps, while the softest, SE-spec cars are genuinely comfortable. Well-bolstered front seats that hold their occupants firmly in place help, and the steering wheel can be adjusted for both height and reach, so it's easy to find a comfortable driving position. The A1 is a proper Audi in miniature, with clear instruments, slick controls and materials that are easy on both the eye and the fingertips. It also has some of the coolest dashboard air vents you'll find anywhere, with each looking like the entrance to a turbine-bladed jet engine. Fortunately, all this style doesn't come at the expense of ease of use. You operate most functions via a single rotary dial that's positioned within easy reach and linked to onscreen menus. What's more, those menus are clearly laid out, and there are shortcut buttons that let you quickly flip between them. The Audi A1 is a compact car with a body that doesn't extend far beyond its wheels, so it's easy to place on the road. Quick, responsive steering also helps, offering enough resistance to instill confidence while still being light for parking. The side windows are deep enough to let you assess the immediate surroundings during that parking maneuver, although the view out back is a little restricted. The manual gearbox and clutch are precise and easy to use, while the optional S-tronic automatic requires even less effort and thought. It can make the engine surge annoyingly as you come to a halt, though. 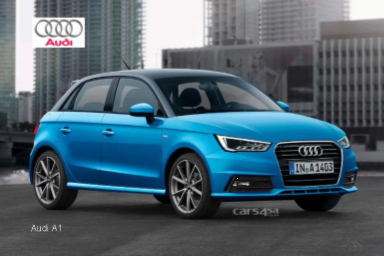 The Audi A1 is available with 1.0-litre and 1.4-litre petrol engines, plus there a 1.6-litre diesel option. If outright performance isn't a concern, the 1.0-litre, three-cylinder petrol engine strikes the best balance between fun and affordability. If you crave more power, even the cheaper 1.4 makes a good sound and has enough punch to whisk you along in breezy style. Meanwhile, the more powerful (and more expensive) version makes the A1 feel properly sporty, but if you really want a fast A1 go for the four-wheel-drive S1 hot hatch, which is a hoot to drive. All A1s have responsive, informative steering, too. Plus they grip well in bends and generally feel much sharper than the average hatchback. The more powerful version of the 1.4-litre petrol engine has an impressive official average of 3.78 litres/100 kms, thanks to a clever cylinder-deactivation system that shuts down part of the engine when you're driving it gently. The 1.6-litre diesel is the one to choose if you do big mileages, then; it averages 3.80 litres/100 kilometers in tests and should be capable of close to 4.7 litres/100 kms in a mix of town and country driving. The Audi A1 is a hugely desirable small hatchback that looks good, is enjoyable to drive and turns out to be surprisingly good value. Well worth considering as an alternative to a Mini.